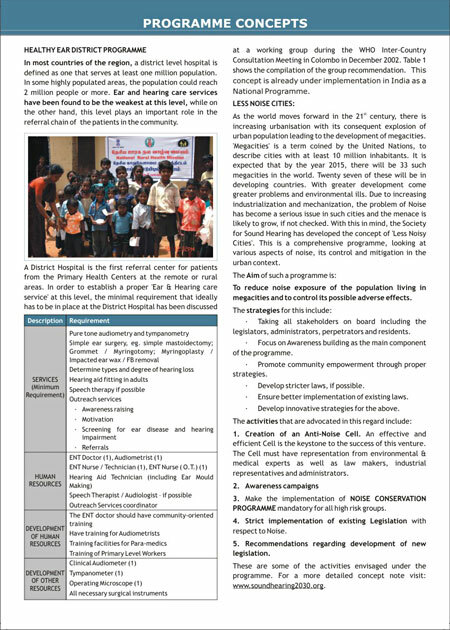 This page outlines the Programme Concepts of the society and describes various Program such as HEALTHY EAR DISTRICT PROGRAMME, SCHOOL HEARING SCREENING PROGRAMME. In most countries of the region, a district level hospital is defined as one that serves at least one million population. In some highly populated areas, the population could reach 2 million people or more. Ear and hearing care services have been found to be the weakest at this level, while on the other hand, this level plays an important role in the referral chain of the patients in the community. A District Hospital is the first referral center for patients from the Primary Health Centers at the remote or rural areas. In order to establish a proper 'Ear & Hearing care service' at this level, the minimal requirement that ideally has to be in place at the District Hospital has been discussed at a working group during the WHO Inter-Country Consultation Meeting in Colombo in December 2002. Table 1 shows the compilation of the group recommendation. This concept is already under implementation in India as a National Programme. As the world moves forward in the 21st century, there is increasing urbanisation with its consequent explosion of urban population leading to the development of megacities. 'Megacities' is a term coined by the United Nations, to describe cities with at least 10 million inhabitants. It is expected that by the year 2015, there will be 33 such megacities in the world. Twenty seven of these will be in developing countries. With greater development come greater problems and environmental ills. Due to increasing industrialization and mechanization, the problem of Noise has become a serious issue in such cities and the menace is likely to grow, if not checked. With this in mind, the Society for Sound Hearing has developed the concept of 'Less Noisy Cities'. This is a comprehensive programme, looking at various aspects of noise, its control and mitigation in the urban context. To reduce noise exposure of the population living in megacities and to control its possible adverse effects. Taking all stakeholders on board including the legislators, administrators, perpetrators and residents. Focus on Awareness building as the main component of the programme. Promote community empowerment through proper strategies. Develop stricter laws, if possible. Ensure better implementation of existing laws. Develop innovative strategies for the above. Creation of an Anti-Noise Cell. An effective and efficient Cell is the keystone to the success of this venture. The Cell must have representation from environmental & medical experts as well as law makers, industrial representatives and administrators. 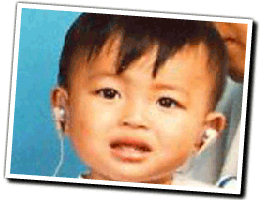 Make the implementation ofNOISE CONSERVATION PROGRAMME mandatory for all high risk groups. Strict implementation of existing Legislation with respect to Noise. Recommendations regarding development of new legislation. These are some of the activities envisaged under the programme. For a more detailed concept note visit: www.soundhearing2030.org.